So, some NFL guys are showboating, huh? Hm. OK.
What started as a single mediocre quarterback protesting police brutality against African-Americans – a worthwhile thing to protest – has now become a movement and a cause celebre, courtesy of a mouthy POTUS who doesn’t have his priorities straight and who has no grasp of politics. Well. Nothing new there, really. It’s de rigeur, really. We’ve almost gotten used to it, less than nine full months into 45’s tenure. Folks all over the place are raising hell, calling for firings, boycotting the NFL – and even their local or favorite teams – burning or throwing away uniforms and swag over … what is it, really? Look, I will always stand for the National Anthem. I’ll even sing it, louder than those around me would probably prefer. I’ll always place my hand over my heart for the Pledge of Allegiance, too. If those around me don’t … um … OK. The less they do, the better my example – kind of like the less liberals vote, the more mine counts. This is fine with me. The issue is bigger than that, however, but on a macro-paradigm or two that some don’t want to consider. First, it’s ironic – if not outright hysterical – that people are protesting the very fabric (pun intended) that allows them to protest to begin with. Criminy, even Antonin Scalia opposed criminalizing BURNING the flag; real conservatives won’t want to REQUIRE anyone to kowtow to it. Second, President Donald Trump – of whom I am no fan – never called for the legal persecution of those who refuse to honor the National Anthem. He said they should be fired. That’s hardly the same thing. If one of my employees trashed me publicly, I might fire him or her; I wouldn’t want her arrested or jailed under the law. The First Amendment is sacrosanct, but free speech has both benefits and consequences – real-life, free-market kinds of consequences. Yeah. It just does. Do I want any NFL players fired? Nah. I don’t care. On the contrary, I want to know who is on what side of this issue. 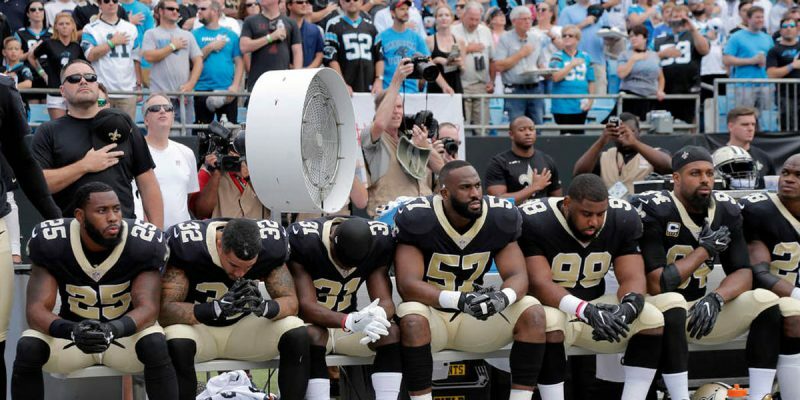 On Monday, I heard radio talk show hosts and callers thereto suggesting that NFL contracts and player handbooks should require players to stand for the National Anthem. Ha. Balderdash. That’s about as effective as forced conversion (to Islam or Christianity, to vaguely cite some historical references), as “conversion therapy” (gay-to-straight), or mandatory don’t-be-transgender BS. Is there a conservative voice here? Anyone? Anyone?? I don’t approve of NFL players or anyone kneeling instead of standing for our National Anthem. I also don’t think they should be punished for it. On the contrary, I want to know, in full clarity, who is so stupid that they think this is an effective form of protest. I want to know my enemy – not the enemy of my country, because I don’t regard them as such, but the enemy of reason. Want to protest excessive force against African-Americans by police? Sign me up. I’m down. Want to protest economic inequality that denies minorities access to decent housing or public transportation to meaningful jobs? I’m on it. (And ask Mitch Landrieu about it.) Want to use your notoriety, based on athletic talent, to draw attention to – what? Nobody knows at this point. You’re just drawing attention to yourselves. Take your millions and form a local foundation. I’ll help – and I don’t charge much to non-profits. Call a press conference. I’ll organize it for you. Kneel? Eh. Keep at it, fellas. On Sunday night, I watched the Green Bay vs. Cincinnati game, and cheered. Then I watched the Redskins beat the Raiders, and cheered. I didn’t watch the opening of either. I didn’t see who knelt or stood. I didn’t care. These guys are talented, they’re well-paid, and they are ATHLETES. They’re not policy-makers. To give them this much attention, for a meaningless gesture, is as silly as the gesture itself. We need to be better as a nation, for sure, especially with regard to racial equality and justice. We don’t need to give pro athletes any more cred than they already have. Move along, people. Nothing to see here. If you keep acting like there is, you’re only contributing to the value of the “undesirables” list. Just stop, and play ball.